When it comes to credit card processing services, you oftentimes have to expect deep expenses. After all, credit card terminals—like the Ingenico iCT220—are extremely expensive (upwards of $300.00) and the services themselves, when all is said and done, make it nearly impossible for small businesses to accept Credit and Debit cards; this is very unfortunate in this day and age. Aren’t there any credit card merchants out there that offer reasonable prices for small businesses? Fortunately for you, there are; welcome to Total Merchant Services, and welcome to the most affordable credit card payment processing company online. Besides the fact that we offer price matching guarantees, some of the best customer service around, month-to-month agreement, and some of the best services you’ll find anywhere, there is one reason that makes Total Merchant Services a no brainer when looking for a payment processing company, and that is our free Ingenico iCT220 offer. Yes, this $300.00 piece of technology is free for you if you use Total Merchant Services for your payment processing, even if you are with us for only a few months. And, best of all, the Ingenico iCT220 isn’t just your run of the mill card processing terminal; it is one of the industry’s best. Here are just a few of the reasons the iCT220 is the terminal to handle your credit card processing needs. EMV Smart Card Ready: The Ingenico iCT220 is EMV (Europay, MasterCard, and Visa) smart card ready so that you will have what you need to process the new industry standard EMV cards. NFC (Near Field Communication) Enabled: Accept ApplePay and Google Wallet as well as contact-less cards on your Ingenico terminal. This built feature of the iCT220 will be covered in your free telephone training call from our credit card terminal specialist. High Level of Security: The Ingenico iCT220 meets even the most stringent security regulations including latest international security algorithms, DES, TDES, RSA, DUKPT and Master/Session. 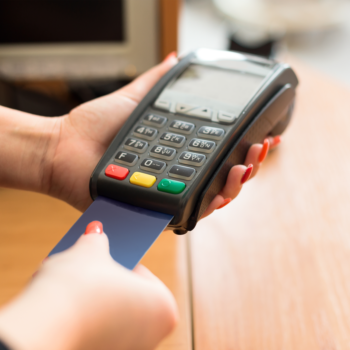 It is EMV and PCI PTS V3 certified and compliant, so you don’t have to worry. 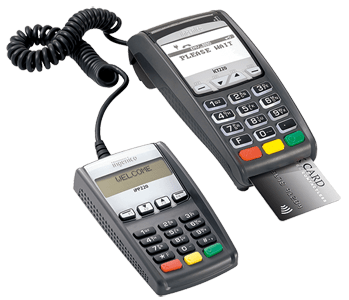 Free Ingenico iPP220 Pin Pad: You can take advantage our Total Merchant Services free Ingenico iPP220 pin pad placement (pictured on the right). With this option the customer can easily swipe their card, wave their phone, or insert a chipped credit card for processing without having to move your Ingenico iCT220 terminal. 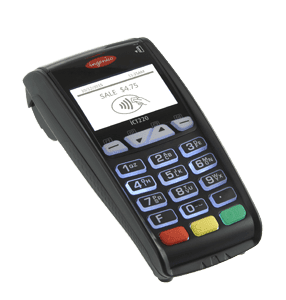 Fast Download and Transaction Speeds: WithEthernet capabilities, the Ingenico iCT220 offers some of the fastest transaction and download speeds out of any payment terminal you’ll ever find over an IP connection. No more waiting around for a card to process, and no more errors; it runs quickly, efficiently, and should be a perfect credit card terminal for your company. Easy to Use: Though we offer a free training to explain how to use the iCT220, you may find that you don’t need it. It’s easy to use, and even the most technologically illiterate person can—and will—learn to use it. This is all thanks to an easy to read LED screen, as well as the large buttons on the iCT220. In the end, even without the free iCT220 offer, we provide some of the cheapest merchant services on the web. We guarantee to match or beat any price that our competitors offer, while still giving you the free Ingenico iCT220 to show how confident we are that you’ll love our services. Here at Total Merchant Services, we understand how important payment processing is for small businesses, and how expensive it can be; that’s why we created this cheap, affordable service to make sure you don’t lose any business from being unable to accept a credit card. Contact Chris Judy of Total Merchant Services now at 1-800-518-6825 for more information concerning our free Ingenico iCT220 offer, or to find out more about our services. Rest assured with our $500 meet or beat guarantee on pricing you will have the best rates available along with your free Hypercom credit card terminal. To get more information complete the below form so that Chris can be in touch with you. Are you ready for your no obligation dial/IP credit card terminal proposal? Get your custom proposal for the Free Retail Terminal now!